^ Stable Channel Update for Desktop. Chrome Releases. Blogger. 2019-04-23 [2019-04-23]. ^ Chrome for Android Update. Chrome Releases blog. Blogger. 2019-03-25 [2019-03-25]. ^ Google Chrome. OmahaProxy CSV Viewer. Chromium team. ^ Chrome - web browser by Google. iTunes Preview. 2019-03-13 [2019-03-13]. ^ Beta Channel Update for Desktop. Google Blogspot. 2019-04-22 [2019-04-22]. ^ Chrome Beta for Android Update. Google Blogspot. 2019-04-17 [2019-04-17]. ^ 7.0 7.1 7.2 7.3 7.4 7.5 Google Chrome. OmahaProxy CSV Viewer. Chromium team. ^ Dev Channel Update for Desktop. Google Blogspot. 2019-04-16 [2019-04-16]. ^ Dougerty, Conor. Sundar Pichai of Google Talks About Phone Intrusion. New York Times. 2015-07-12 [2018-04-09]. （原始内容存档于2015-07-14）. ^ Aimo. 真的改名“酷容”？Chrome中文名再现. 太平洋电脑网. 2012-05-12 [2016-10-09]. （原始内容存档于2016-08-26） （中文（中国大陆）‎）. ^ 红薯. Chrome“谷歌浏览器”真的变为“酷容浏览器”. 开源中国. 2012-05-05 [2016-10-09]. （原始内容存档于2012-07-18） （中文（中国大陆）‎）. ^ Paul, Ryan. Google unveils Chrome source code and Linux port. Ars Technica. 2008-09-02 [2012-07-11]. ^ Welcome to Chromium. 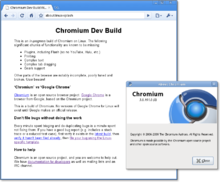 blog.chromium.org. ^ Explaining Why We Don't Endorse Other Systems. gnu.org. [2018-04-07] （英语）. The central part of Chrome OS is the nonfree Chrome browser. ^ A fresh take on the browser. Google. [2009-08-28]. ^ 18.0 18.1 18.2 Scott McCloud and Google Chrome team. Google Chrome By the Google Chrome team, comics adaptation by Scott McCloud. Google Books. 2008-09-01 [2008-09-01]. ^ （英文） The best new Windows programs of 2008. Download.com. 2008-12-29 [2009-08-28]. ^ Statcounter. Desktop Browser Market Share Worldwide | StatCounter Global Stats. gs.statcounter.com. [February 9, 2018] （英语）. ^ Cunningham, Andrew. Chrome 50 ends support for Windows XP, OS X 10.6, other old versions. ArsTechnia. 2016-04-14 [2016-10-09]. （原始内容存档于2016-05-05） （英语）. ^ XP系统最后版本Google Chrome 49.0.2623.112 官方下载地址. 和金网络科技. [2016-10-09]. （原始内容存档于2016-10-09） （中文（中国大陆）‎）. ^ Niall Kennedy. The story behind Google Chrome. 2008-09-03. ^ Sun Valley: Schmidt Didn’t Want to Build Chrome Initially, He Says. 2009-07-09. ^ Scott McCloud. Surprise!. Google Blogoscoped. 2008-09-01 [2008-09-01]. ^ Philipp Lenssen. Google Chrome, Google's Browser Project. 2008-09-01 [2008-09-01]. ^ 28.0 28.1 28.2 28.3 28.4 28.5 28.6 28.7 28.8 28.9 Philipp Lenssen. Google on Google Chrome - comic book. Google Blogoscoped. 2008-09-01 [2008-09-01]. ^ Google Chrome. Google Books. 2008-09-01 [2008-09-02]. ^ A fresh take on the browser. The Official Google Blog. 2008-09-02 [2009-08-24]. ^ Google Chrome now live. The Official Google Blog. 2008-09-02 [2009-08-24]. ^ Pichai, Sundar; Upson, Linus. A fresh take on the browser. Official Google Blog. Google. 2008-09-01 [2017-03-09]. ^ Needleman, Rafe. Google Chrome update: First screenshot, and live-blog alert. CNET. CBS Interactive. 2008-09-02 [2017-03-09]. ^ Google launches Chrome web browser. The Canadian Press. Associated Press. 2008-09-02 [2008-09-02]. ^ Come on Google... Chrome for Mac?. November 2008 [2008-11-22]. ^ Danger: Mac and Linux builds available. [2009-06-09]. ^ Mark Larson. Beta Update: Linux, Mac, and Windows. Google. 2009-12-08 [2012-07-11]. ^ Google Chrome for the holidays: Mac, Linux and extensions in beta. Googleblog.blogspot.com. [2012-07-11]. ^ A new Chrome stable release: Welcome, Mac and Linux!. Google Chrome team. 2010-05-25 [2010-05-25]. ^ Microsoft offers browser choices to Europeans. BBC News. 2010-03-01 [2010-05-13]. ^ Google Chrome Beta arrives on Android. Engadget. [2012-07-11]. ^ （简体中文） Chrome超越Firefox成為英國第二流行的瀏覽器. 2011-08-02 [2011-12-14]. ^ （英文） Google Chrome Releases. Google Chrome Releases. ^ （英文） ChangeLog - v8. ^ （英文） Beta release: 0.3.154.9. Google Chrome Releases. 2008年10月30日 [2009年9月3日]. ^ （英文） Beta release: 0.4.154.29. Google Chrome Releases. 2008年12月1日 [2009年9月3日]. ^ （英文） Beta release: 0.4.154.25. Google Chrome Releases. 2008年11月24日 [2009年9月3日]. ^ （英文） Dev update: New Gears. Google Chrome Releases. 2008年12月23日 [2009年9月3日]. ^ （英文） Dev Update: Bug Fixes. Google Chrome Releases. 2009年2月11日 [2009年9月3日]. ^ （英文） Beta Update: Bug fixes and translations. Google Chrome Releases. 2009年5月15日 [2009年9月3日]. ^ （英文） Stable Update: Google Chrome 2.0.172.28. Google Chrome Releases. 2009年6月23日 [2009年9月3日]. ^ （简体中文） Google Chrome Dev Channel升級到3.0.195.3，支持主題換膚. 谷奧. 2009年7月29日 [2009年9月3日]. ^ （简体中文） Google Chrome Beta分支更新到3.0.195.10. 谷奧. 2009年8月28日 [2009年9月3日]. ^ （简体中文） Google Chrome Dev版開始支持Windows 7的新特性Jump Lists（跳躍菜單）. 谷奧. 2009年8月10日 [2009年9月3日]. ^ （简体中文） Google Chrome Dev分支升級，Windows到4.0.221.6，Mac/Linux到4.0.221.8. 谷奧. 2009年10月8日 [2009年10月8日]. ^ （简体中文） Google Chrome Stable升級到4.1.249.1036，加入自動翻譯功能. 谷奧. 2010年3月18日 [2010年3月18日]. ^ 穩定版本的Google Chrome內置Adobe Flash Player插件. 2010-06-30 [2010-08-09]. ^ Issue 174455: MathML support broken with Chrome 25 beta. 2013-02-05 [2013-02-19]. ^ Matthew Chu. Chrome 將採用新設計！UI 反應將更靈敏. 流動日報. ^ Aditya. Google Chrome and the Blue Screen of Death. 2008-09-05 [2008-09-16]. ^ Megan. 使用隐身模式进行私密浏览. Google. [2017年5月9日]. ^ Why Is the New Google V8 Engine So Fast? [Part 2]. Nikkei Electronics Asia. 2009-01-14 [2011-09-16]. （原始内容存档于2013-06-15） （英语）. ^ Why Is the New Google V8 Engine So Fast? [Part 3]. Nikkei Electronics Asia. 2009-01-15 [2011-09-16]. （原始内容存档于2013-06-15） （英语）. ^ 73.0 73.1 網頁工具：表單自動填入. Google. ^ Philipp Lenssen. Google Chrome Screenshots. Google Blogoscoped. [2008-09-02]. ^ Aaron Boodman. Extensions Status: On the Runway, Getting Ready for Take-Off. Google. 2009-09-09 [2010-05-13]. ^ Erik Kay. Extensions beta launched, with over 300 extensions!. Google. 2009-12-08 [2010-05-13]. ^ Nick Baum. Over 1,500 new features for Google Chrome. Google Chrome Blog. 2010-01-25 [2010-05-13]. ^ Rename about:labs to about:flags, part 3/3.